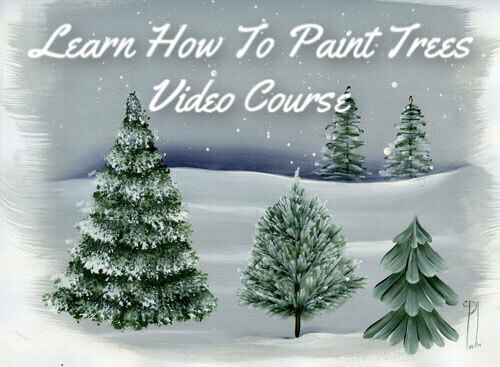 Learn HOW TO CRACKLE PAINT in various ways. There are many answers to your question of how to crackle paint. First you need to decide what sort of effect you want. Are you looking to imitate old flaking paint? Do you want to coat a painting or surface with a delicate transparent crazing? Or maybe the look of old cracked wood interests you. 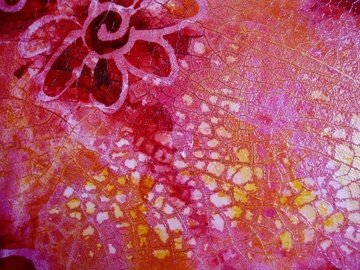 So let’s explore how to crackle paint by testing some of the mediums available on the market. What a great product to use for creating a peeling, cracking paint effect that suggests antiquity. The Americana Decor® Crackle Medium performed exactly as promised! Here's a simple project for you to try. Easy clay pot project using Crackle Medium and Chalky Finish paint. Seal a clean clay pot with DecoArt Multi Surface Sealer. Let it dry completely. Using a 1-inch flat brush, apply a coat of DecoArt Dazzling Metallics in Venetian Gold (DA072) to the outside of the pot. Let it dry completely. It may need another coat. Let that dry as well. Clean the brush and blot it very well. Using a clean, dry 1-inch flat brush, apply the medium evenly all over the outside of the pot. Let it dry. Depending on the level of humidity in your environment this may take a half hour or much longer. Don't force dry. Before the next step, decide if you want the cracks to appear vertically or horizontally. Next, when dry, apply a thick coat of Vintage paint, working very quickly without overlapping your application of paint. The cracks begin to form immediately. Avoid overworking the paint. If you desire finer cracks, apply a thin coat of the paint. It's fun to watch as the paint begins to shrink on top of the medium revealing the luscious color underneath! Did I mention I really like crackling effects? To protect the finished clay pot, apply a coat of Americana Decor® Crème Wax (Clear). Embellish with beads or lace if desired. Clay pot all decked out in finery! What a fun little project to learn how to crackle paint. Let me know what you think of it or if you have any questions, drop me a line here. 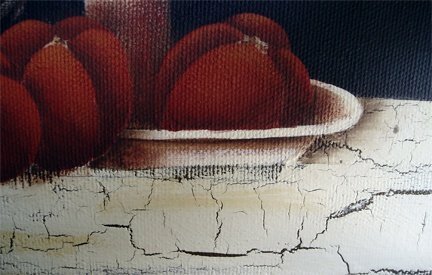 In this detail of a larger painting, we used Crackle Paste manufactured by GOLDEN. This is a a very thick medium that goes on and remains opaque after drying. It's been formulated so that as the medium dries it creates deep fissures and cracks. It is not recommended that this medium be speed-dried. A thick application will require days to dry. The heavier the application, the bigger the cracks. Applied thinly the medium cracks lightly or not at all. It's best to use this product on a rigid surface because of the extreme shrinking that occurs. Priming the surface with a couple coats of Gesso is recommended to ensure good adhesion. The crackle medium is absorbent which makes it ideal for applying washes of colors. We did many layers of washes and pours of thinned paint to create the example above. See how the cracks filled with color. 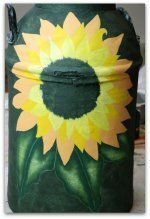 You can also tint this medium with GOLDEN Heavy Body and Fluid Acrylic paints up to 10% by volume. You can also add Gel Medium which seems to increase the adhesion. A good addition if you want to use it on canvas. Again, no more than 10% addition by volume. In this detail of a larger painting, we used Weathered Wood by DecoArt. This is a layered process. In essence the medium is sandwiched between coats of contrasting colored paints. Here the background was painted Black and allowed to dry thoroughly. A heavy coat of Weathered Wood was applied and allowed to dry. And finally, a heavy coat of Buff paint was quickly brushed over the top. Any over-working of the paint will undo the crackle effect. So lots of paint and work quickly. The cracks will appear almost instantly. Frescolina by Selkirk Painting Co.
Frescolina by the Selkirk Painting Co. is a texture paste which dries to an opaque white. Sadly it's no longer available. But as soon as I can find a suitable replacement I'll let you know. In the event you have some in your inventory of craft and art supplies, here's how it was used. 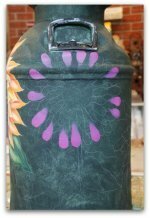 On this mini basket lid, Jodi applied a solid thin coat of the medium. 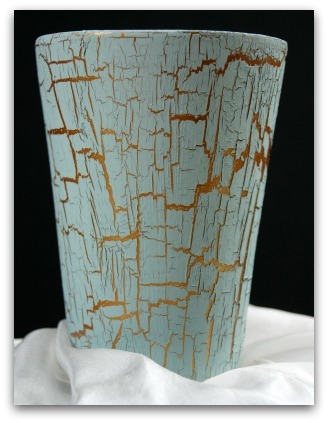 To create the crackled effect, she used a hair dryer to force the cracks. Speed-drying does not compromise the stability of this medium. Once dry, you can paint the Frescolina. Or you can pre-tint it with an acrylic based paint. To showcase the cracks, a wash of Burnt Umber was applied. 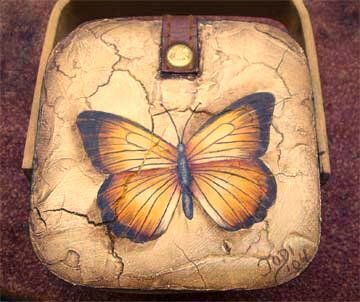 And when that dried she went ahead and painted the lovely butterfly on top. Frescolina does adhere well to both rigid and flexible surfaces. It can be applied with a palette knife or brushed on. 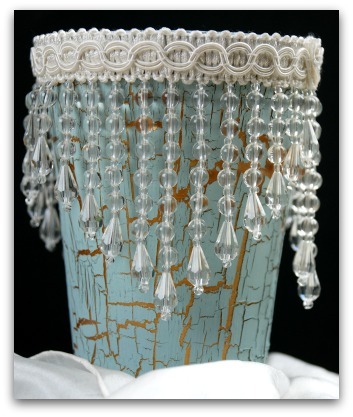 If you can't find Frescolina in your craft store, Jodi has re-created this project using a different crackle medium. 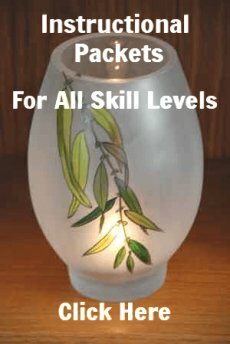 The pattern packet instructions are available here. 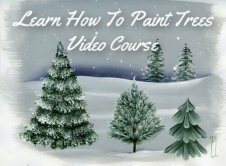 Is there more you would like to know about how to crackle paint? If you have questions, comments or tips, feel free to contact us. 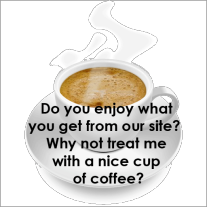 Would you like to explore our site for more fun and information? Let's leave How to Crackle Paint and go to Faux Painting Ideas.